Keto-Mojo Help Docs & FAQs - What should my ketone reading be? All Categories ​>​ Frequently Asked Questions, FAQs ​>​ What should my ketone reading be? What should my ketone reading be? 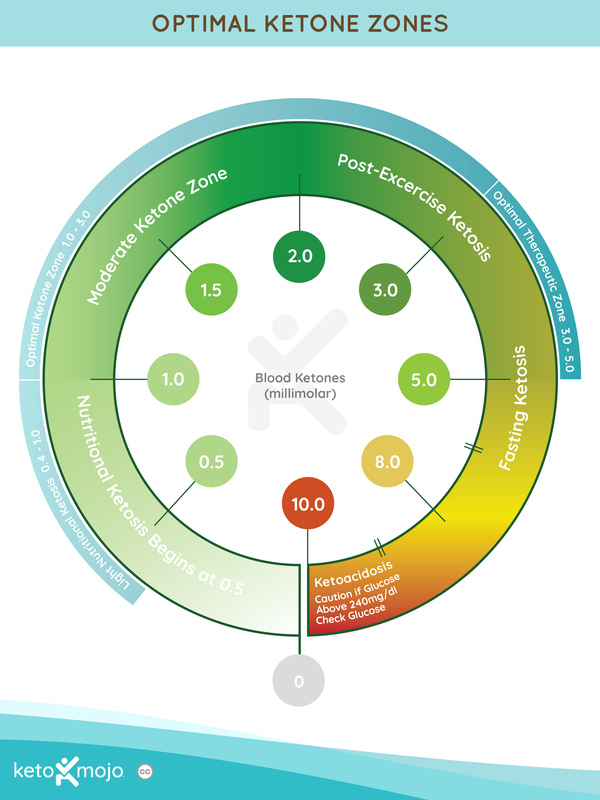 According to Dr's Jeff S. Volek Phd, RD and Stephen D. Phinney MD, Phd , authors of The Art and Science of Low Carbohydrate Living, the optimal zone for nutritional ketosis is between 0.5 to 3.5. We like to test our ketones first thing in the morning before breakfast, as generally, they are at their lowest, and that gives you a baseline for the day. The second time for testing is just before our evening meal when generally they are at their highest. In addition to those times we do curiosity testing, that is before a meal and at 30, 60 and 120 mins after eating to see what foods might be affecting our ketone level. We find that glucose testing is good for identifying food triggers as blood sugar changes far more rapidly than ketones (ketones are slow to move and sometimes it's what happened the day before that matters most). In such, when investigating foods our go-to sleuthing tool is the glucose test. Same protocol as before. That is before a meal and at 30, 60 and 120 minutes after eating to see what foods cause a significant glucose spike (more than 30 mg/dl). Need more ketone strips? You can order them here.